We are happy to announce our recent update to the ISO 9001:2008 certification requirements! As one of the nations finest machine shops, we prize our quality program as one that challenges the status quo. 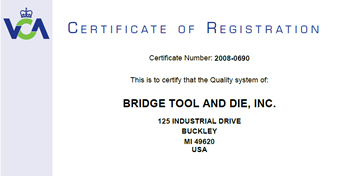 Part of showing this to our customers is by undergoing the process of becoming certified under UKAS Management Systems. To learn more about this certification, please feel free to message us through our contact form below. If you'd like to learn more about UKAS and VCA take a look at their website: http://www.dft.gov.uk/vca/.